In our JOIN THE BAND® MUSIC LESSONS STUDIO, everyone participates in and is encouraged in teamwork, respect, patience, focus, kindness, honesty, and support. We offer private music lessons, band classes, music camps, and workshops. Over a 1000 student band members have performed in more than 3000 band performances of over 1,800 different songs, all played in 115 plus concerts. We currently average over thirty bands a session and since 1998 have performed at clubs throughout Los Angeles including The Knitting Factory, Whisky A Go Go, Roxy Theatre, The Mint, The Federal Bar, Cozy’s, The Baked Potato, Amazon Bar and Grille, and Smoking Johnnies. Our JOIN THE BAND® MUSIC LESSONS STUDIO location offers private music lessons on guitar, piano, drums, voice, bass, ukulele and more. 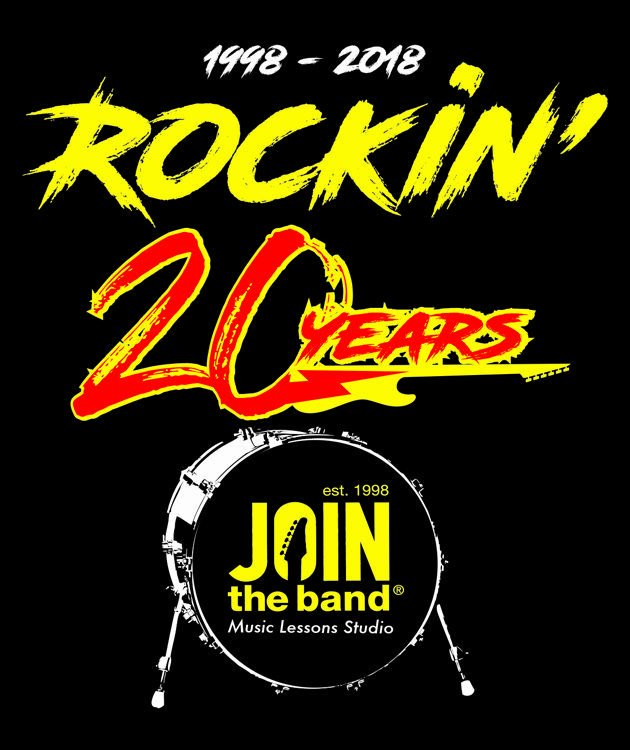 Join the Band® has been rockin’ for over 20 years. We offer a variety of band performance classes and private music lessons. We are also the original rock band performance program in the Sherman Oaks area of Los Angeles. Join the Band® has more experience than any other studio running rock band performance classes and private music lessons. We believe we are the best based on what our students say. Visit our testimonial page for their comments. When did Join the Band start? Join the Band®, was founded in 1998 by Los Angeles guitarist and instructor John Mizenko. A graduate of Boston’s Berklee School of Music, John has enjoyed a successful career as both performer and educator. He takes great pride in his students and strives to help them develop both their potential as performers and their enjoyment of playing music. How did Join the Band start? After many years of successful private music instruction. John recognized the need for his guitar students to experience playing with other musicians in a band setting. These music classes quickly grew into Join the Band®. The first official concert was held at Full Blast Rehearsal studios in Van Nuys with three bands on Saturday, November 8th, 1998. Bands rehearse in our state-of-the art Join The Band® Music Lessons Studios. We supply the amplifiers, drums, keyboards and sound system. Plug in and play! Guitar and bass amplifiers from Fender, Mesa Boogie, Line 6, Gallien Krueger, and SWR. Drums and cymbals from Ludwig, Drum Workshop (DW), Soul Tone and Zildjian. Recording hardware and software from Pro tools, Logic. Keyboards and Keyboard amps from Yahmaha, Korg and Roland. Modern Sound System & equipment from Mackie, JBL, Yamaha, DBX, & Lexicon. Microphones from Shure and Audix.